A mountain to be climb might be an understatement for Santiago Solari's men as Real Madrid face Barcelona again at their own den. Unlike the last fixture, Los Blancos will face the Blaugrana in the La Liga this time around, with hope of restoring some parity after failing to win against their bitter rivals in the three times they met in 2018/19. The odds are stacked against Los Blancos with their coach, Santiago Solari, desperate for a positive reaction from his players. Yet they are nine points behind Barcelona, who sit comfortably at the top of La Liga with 57 points after 25 matches. Real Madrid are also out of the Copa Del Rey, knocked out after a 4-1 aggregate defeat against Blaugrana this week. It is also somewhat evident that Barcelona might not have to push hard for a win at the Santiago Bernabeu, just like they did in the Copa Del Rey second leg a few days back. Real Madrid attempted more shots and kept the tie even till the first half yet the squandered chances from Vinicius Junior and Karim Benzema came back to haunt them. " Luis Suarez got two chances, scored twice and propelled Varane to put the ball into his own net to depict the Blaugrana's clinical finishing in front of goal. Although Casemiro and others were reluctant to speak about Cristiano Ronaldo in the post match, there is no doubt that they miss the presence of their all time record goalscorer. One can't help but wonder what would have happened if their former talisman was there to receive the chances. Despite Benzema enjoying a much better campaign than his recent seasons, Cristiano knew the right place to step up and finish the chances in times of need. Despite Santiago Solari trying a massive turnaround, Zinedine Zidane's impact is also evident now that he has gone. Benching stars Isco, Marcelo and Bale to make way for new faces is a refreshing change but the spark and hunger which propelled the Los Blancos feels missing this time around. As things stand, the only way is forward for Real Madrid as they look to restore parity against their eternal rivals tonight. Solari was not wrong when he spoke about limiting Barcelona's chances but the onus will be to improve the efficiency in front of goal and work on the negatives with one eye on the crucial Champions League tie against Ajax. It goes without saying that unless Real Madrid win the UEFA Champions League for the 4th time in a row and Barcelona fail miraculously in La Liga, this season will be a massive failure for them. 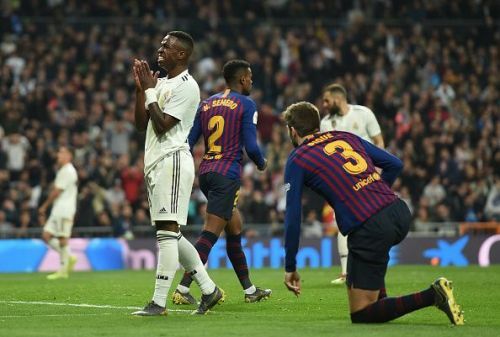 Barcelona also averages 3 goals per game against Real Madrid at the Santiago Bernabeu, which will be one of the things to change for Solari and co. The one consolation among the negatives is that Real Madrid are known for scaling the biggest mountains. And along with that what may seem impossible today, may not look so out of reach tomorrow. Real Madrid will be banking on their mentality and the inspiration from their glories in the past three seasons to climb another mountain and against no other team but Barcelona.